Mid-Life Cruising!!! 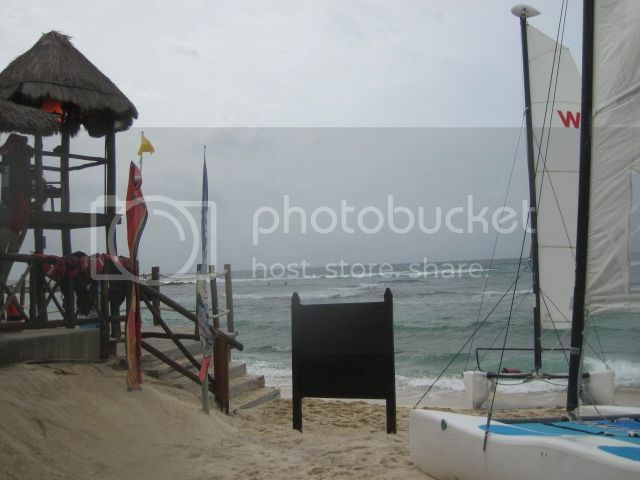 : Hobie Cat Sailing in Mexico! 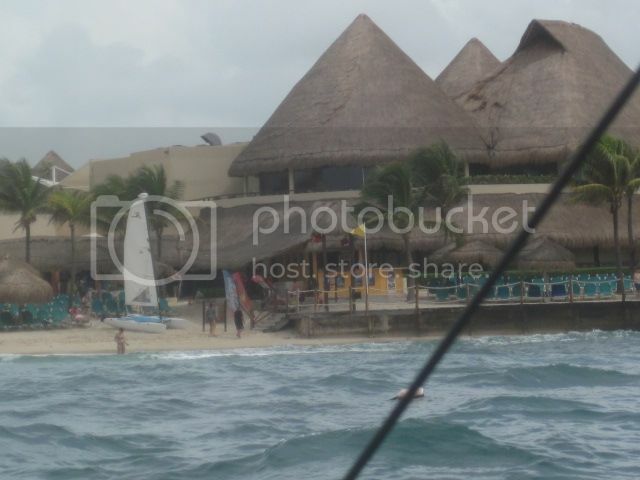 Hobie Cat Sailing in Mexico! As I mentioned I was going to do in my last post about snorkeling in Akumal, I woke up on our last full day in Mexico with a plan. 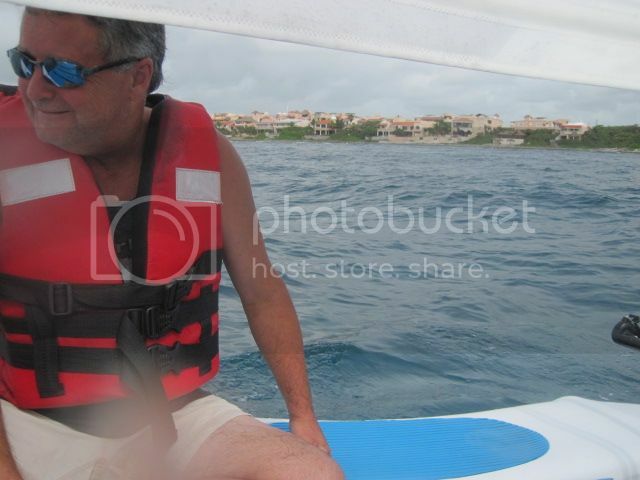 The very first thing I was gonna do that morning was walk straight to the lifeguard stand on the beach and see if I could manage to talk my way onto a Hobie cat sailboat. Free sails came with our all-inclusive stay at the "Catalonia" resort, but there had been no sailing throughout our entire stay due to bad weather. I was hopeful that things would change before we left. After all, the free sails is what prompted me to choose the "Catalonia" resort. Not too many all-inclusive resorts offer free sailing, and I really wanted to go sailing on one of these little boats. As I turned the corner towards the lifeguard stand here's what I saw ... sails ON the Hobie cats! I walked up to the guy at the lifeguard stand and asked if they'd be sailing that morning. As you can see in the picture above, the skies were pretty gray and I was hoping we could beat the rain. The guy didn't speak much English, so I turned to the guy messing with the two sailboats and asked him if he could give me and my husband a sail. That guy turned out to be Herman, and he said if I hurried back with my husband he'd give us a sail before the weather turned bad. I told Herman that I'd be right back, and I had to refrain from running back to our room to get Ken. A few minutes later Ken and I were putting on our life jackets and helping Herman push the sailboat off the beach. 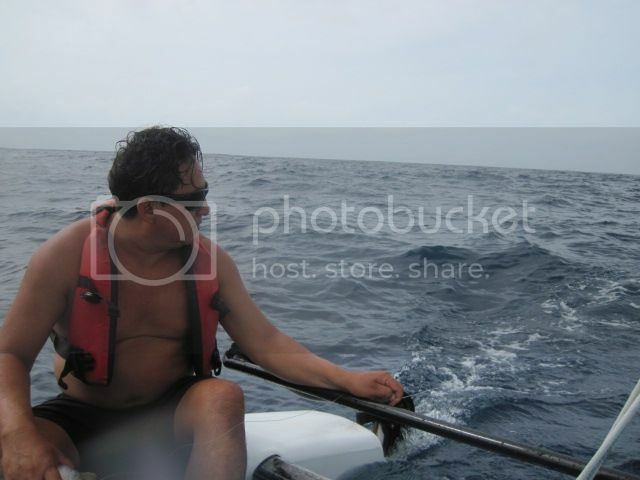 Although the skies were gray, the winds had died down and Herman wasn't able to control the boat as much as he'd like ... meaning we had to hold on tight as the waves broke on the side of us. Falling off the boat wouldn't be a big deal, if the water wasn't shallow with huge boulders underneath us! Herman kept trying to get past the breaking waves without much success. 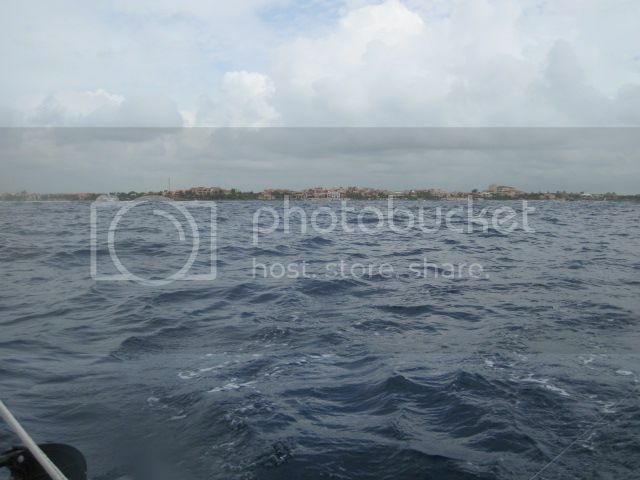 After getting slammed by a wave about a dozen times, I finally said, "Maybe today's not a good day for this". I couldn't believe I was saying that, but I know Ken was thinking the same thing and I didn't want to bust my head open on the rocks. Herman responded by saying that the lack of wind was making it difficult, and that the water was shallow with rocks ... we know! But, Herman didn't give up and after a few more tries he was finally able to catch enough wind to get past the breaking waves. We were finally sailing, and getting away from the rocks. 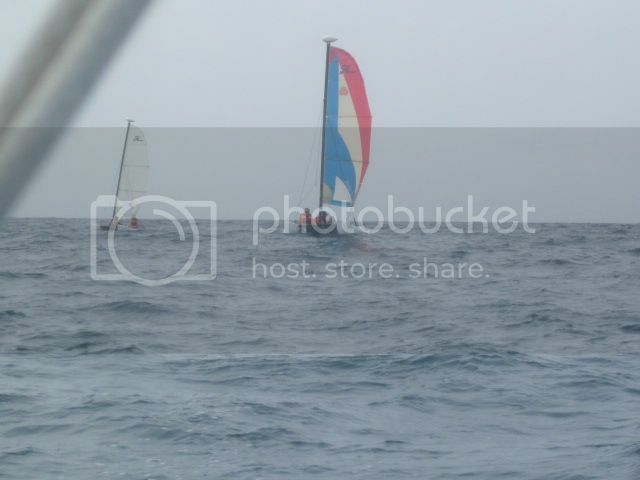 I'd never been on such a small sailboat, and it was kind of weird sailing so far out into the sea on a little sailboat. We kept going further and further out, and Ken and I couldn't stop smiling. and we sailed further away from shore. Herman asked if we were scared of fish ... did he see a shark?! No, he just wanted our permission to throw out a fishing line. We said that would be great, so he grabbed a simple piece of wood with fishing line wrapped around it. He showed us the lure, threw it out, and pulled on it every now and then. I would have loved to see him pull up a fish, but no such luck. 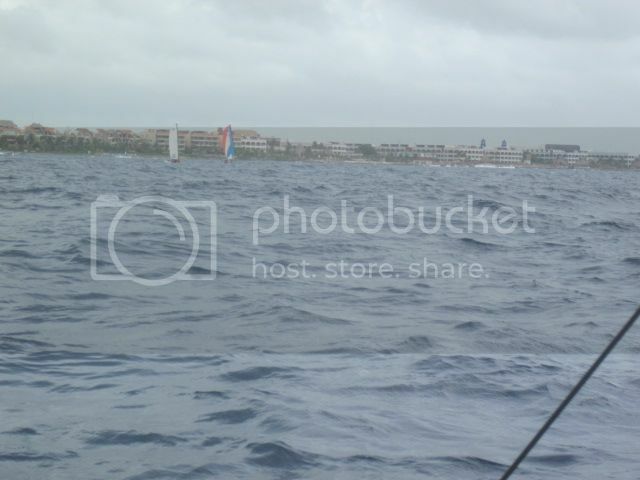 The other boats caught up with us and we sailed about 10 more minutes before heading back to shore. 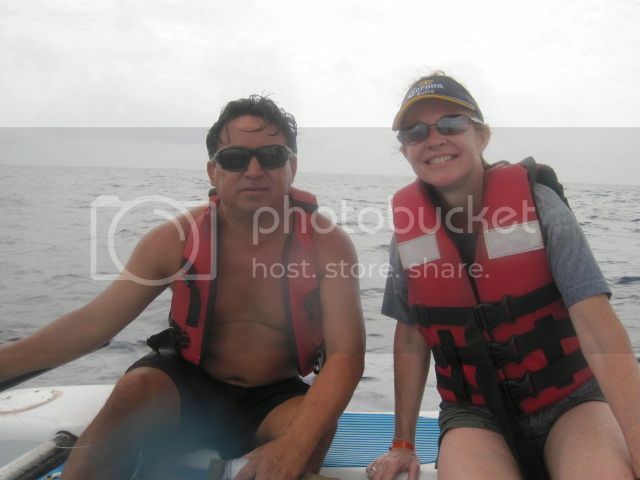 Once we got close to shore and Herman caught a wave, we rode in pretty fast ... so fun! 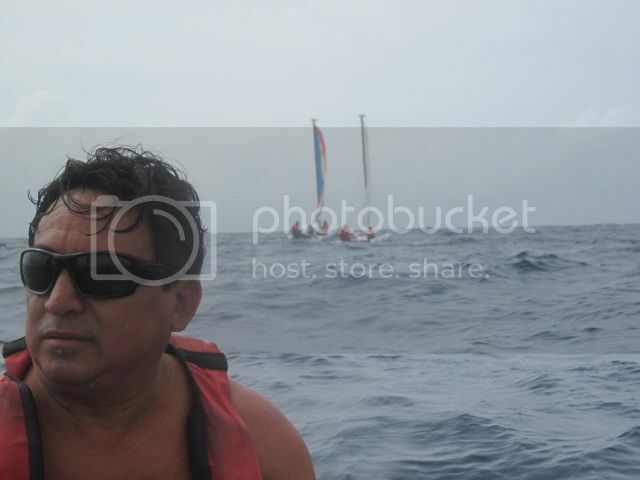 We sailed for about 30 minutes, and were sure to give Herman a tip for taking us out. We felt lucky to be able to sail on our last day, and once we realized we wouldn't bust our heads on the rocks we had a blast. Next post ... how we spent the rest of our last day in "paradise". It looks like you guys had a great time! Just found your blog via "Where the Coconuts Grow," and I'm looking forward to following along with your adventures! I love Hobie Cats. 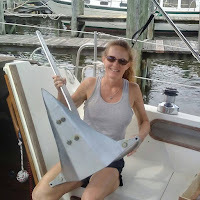 Mark taught me to sail on one when we were first married. 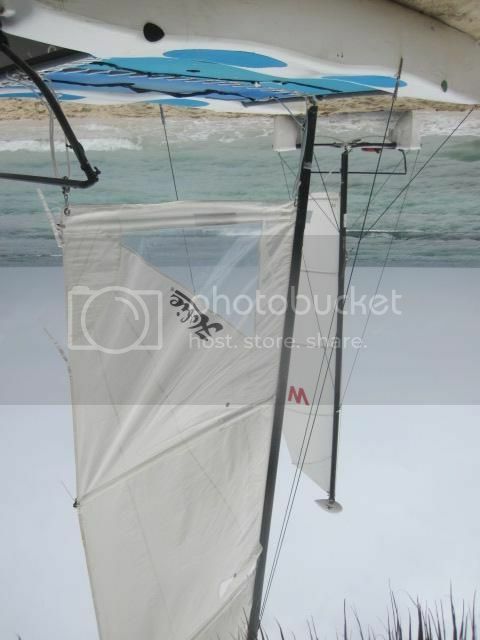 When we had all the rigging tuned and the wind was up, the boat would hum to us. Such excitement.